I have tried to summarize my construction posts here to make it easier for someone to get an overview of what was done. I consider this a living document and will try to make additions and changes as my cabin progresses. Before you buy any containers or do anything else, you should have some idea how you want to live in your shipping container cabin. Figure out how much space you want, or really need, and start working up a floor plan. 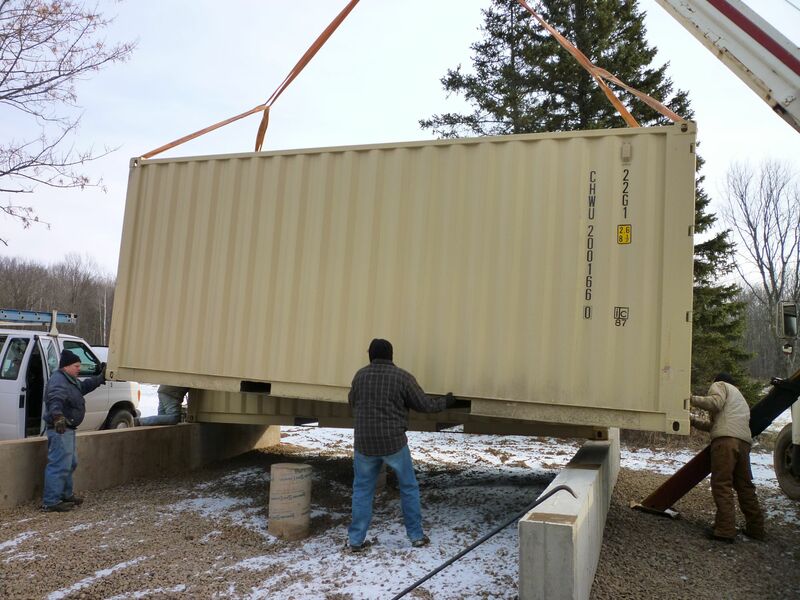 For the most part you will be limited to standard shipping container dimensions of 8’x20′ or 8’x40′ and multiples of these. The simplest arrangement of containers is to line them up as I did, but you are really only limited by your imagination and checkbook. 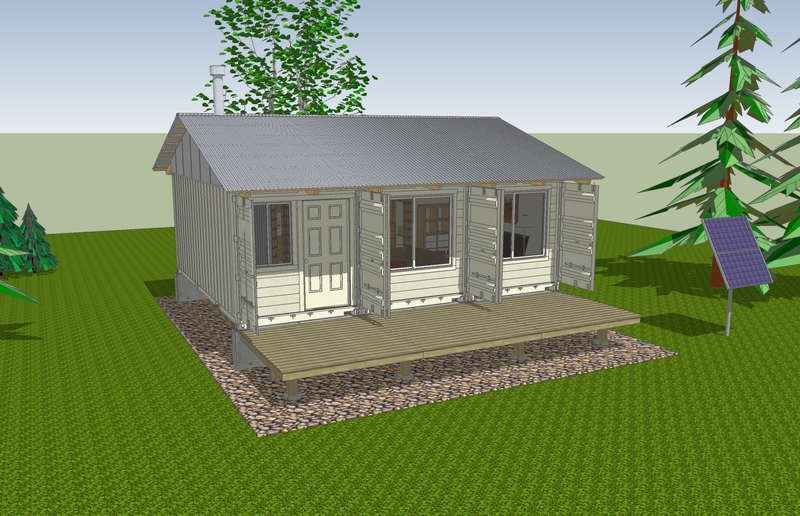 A great tool to design your shipping container cabin is Google SketchUp. You can get detailed shipping container models for Google SketchUp from ISBU News, and almost everything else you might need from Google’s 3D Warehouse. If you are looking for some inspiration, take a look at the tiny house websites Tiny House Design and Tiny House Blog. 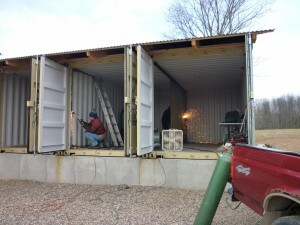 If you are thinking about removing any walls or other structural components of a shipping container, it would be best to consult with a qualified engineer. 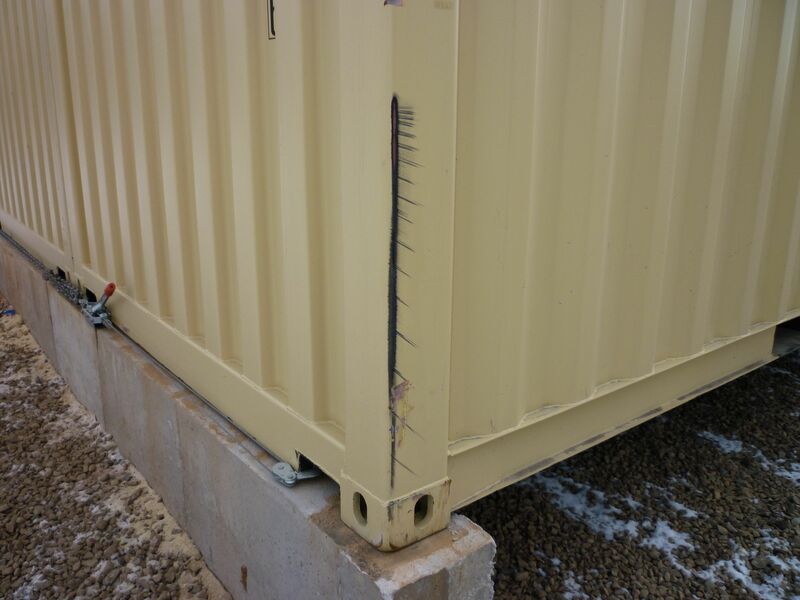 Removing structural components of a shipping container, without the proper reinforcement, could make the structure unsafe. 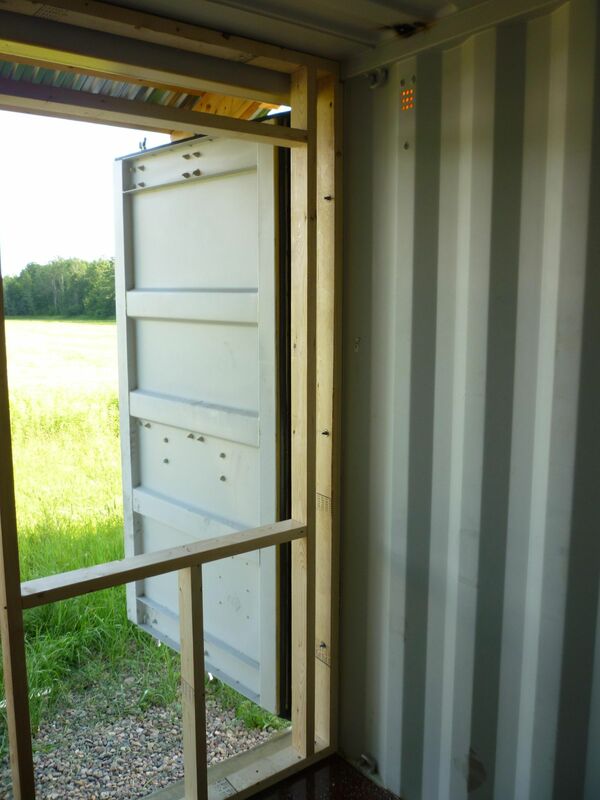 A few openings for doors and windows will probably not affect a containers structural integrity, but large scale modifications like mine definitely will. One of the more well known engineers in this field is George Runkle of Runkle Consulting. He was very helpful with my small project, and I recommend him without reservation. Depending on where you obtain your containers, you may need to plan for this well in advance. My containers were special ordered from China and took over four months to arrive. Used shipping containers are more readily available, but then you don’t really know what’s been inside them during their service. There are too many places to buy containers to list them here, but a quick search on the net will turn up more than you need. Another option is to search craigslist for containers that are nearby. Buying them locally will allow you to inspect them before you buy, which is critical when shopping for used containers. 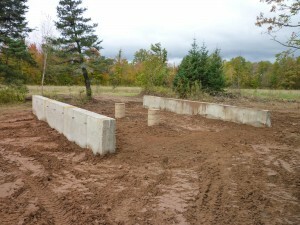 A foundation can range anywhere from some concrete or wooden supports on the ground for a single container all the way up to a full basement for multiple containers. Your decision will need to consider both what is structurally required and your own personal preferences. It’s probably best to consult with a qualified builder or engineer to design a proper foundation for your container cabin. 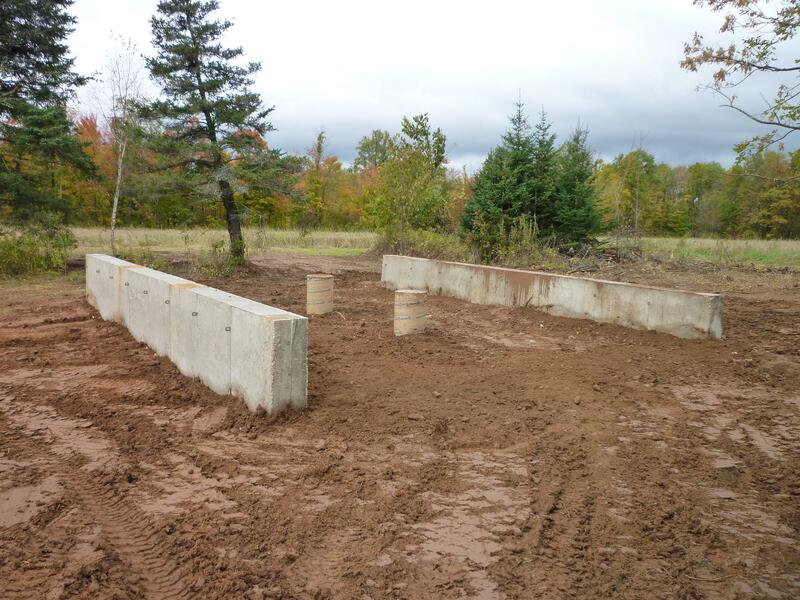 If you decide on some type of poured concrete foundation, then you should plan on embedding steel plates into the concrete where the container corner blocks will rest. 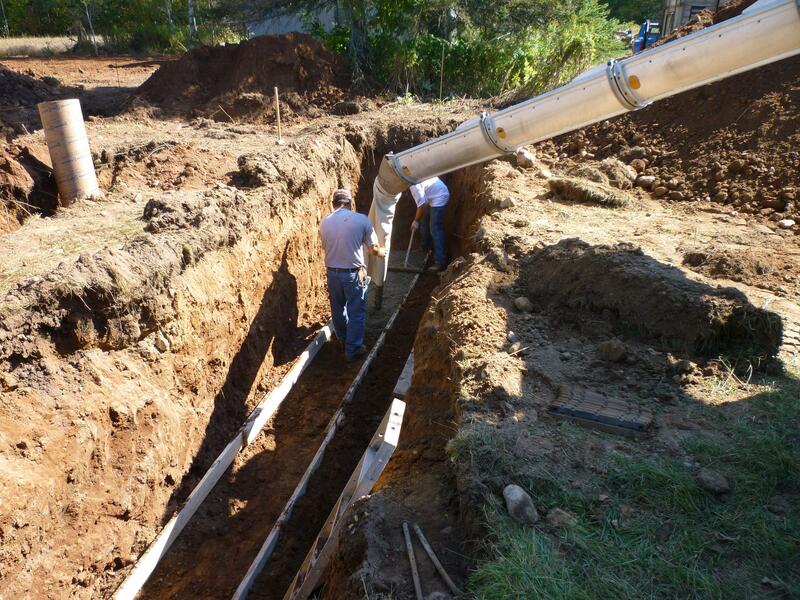 This will allow the containers to be welded directly to the concrete foundation. My steel plates were 10″x10″x1/4″ with lengths of angled rebar welded to each of them. These were then inserted into the foundation right after the concrete was poured. The foundation below was designed to support three connected 8’x20′ shipping containers. While this could have been accomplished with piers instead of walls, I much preferred the look of walls. Take note of the two piers in the center of the foundation. These were required to add additional support to the floors since I was removing all of the walls between the containers. This type of support may or may not be required depending on how much, if any, of the walls you remove. If you need a cheap and easy do-it-yourself foundation, piers are probably the best choice. They also have much less impact on the site if that is important to you. The easiest way to place shipping containers on your foundation is with a crane. I have seen a lot of different methods on the web, but nothing beats the ease, speed, and safety of a crane. Not having a crane myself, I hired out the task to a local builder. He had a small crane that he uses for setting sections of prefab houses, which worked very well. If you don’t have access to a crane, there are other ways to move containers, especially 20 footers. Some container suppliers have Swing Thru trucks that can not only deliver, but also lift and set containers a short distance from the truck. 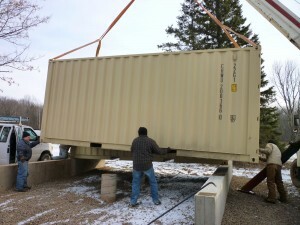 If your container supplier has one of these and can get close to your foundation, you’re set. Another option is to rent a rough terrain forklift for a few hours. 20′ shipping containers have forklift pockets built into them specifically for this type of handling. Forklift capacities vary greatly, so make sure you get one that can handle the ~5,000 pound weight of a 20′ container. Once your containers have been placed on the foundation, it’s relatively easy to make any final adjustments with a large crowbar. As you can see in the picture below, a single person can easily adjust a container with just one crowbar. 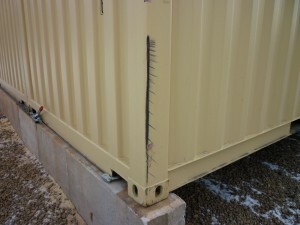 Containers can be connected using bolts, specialized clamps, or through welding. The easiest method for DIYers, but not necessarily the most secure, would be with sets of large bolts and drilled/punched metal plates. The metal plates would need to fit inside the corner fittings, and would act as heavy duty washers for the bolts. I had some of these made for me, and while they would have worked, we finally decided to just weld them together since the welder would be there attaching the containers to the foundation plates anyways. I would still consider using bolts, however, if I ever thought I would want to disassemble the structure someday. A really slick alternative, although usually very expensive, would be to use clamps specifically designed to connect containers together. An excellent example of these are the TANDEMLOCHorizontal Connectors. These would be an excellent choice if you needed some type of quick assembly and disassembly built into your container structure. The most secure method, and probably not that difficult for a handy person, would be to simply weld the containers together. As long as you never plan to disassemble the containers this is probably the best option. Since I have never welded anything myself, I can’t really give any advice here on welding containers. Just be sure to let your welder know that they will be welding Corten steel. Something very simple that I never thought of, but fortunately my contractor did, was to use come-alongs to pull the containers tightly together for welding. It was easy, worked very well, and I would definitely do it again. 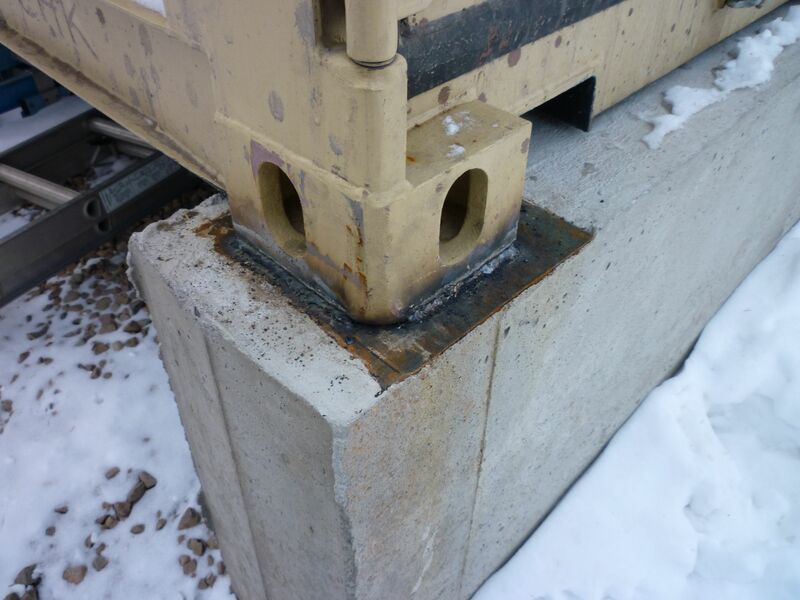 The pictures below show the come-alongs used to hold the containers together, a container to foundation plate weld, and a container to container weld. While I’m not an expert, the welds did look a bit rough to me. Maybe there’s just a different standard I need to get used to in the boonies of northern Wisconsin. Before any structural components (i.e. walls) are removed, and before the roof goes on, it’s time to add any structural reinforcement that may be necessary. As mentioned in section two above, I highly recommend that you consult a qualified engineer to spec out any structural reinforcement you may need. 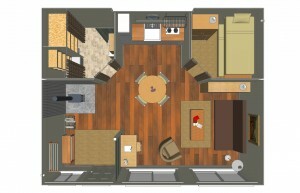 While I can’t make recommendations for any other shipping container cabin, I can tell you what was done for mine. Since I was removing all four of the interior container walls, considerable reinforcement would be needed to replace the support being lost. 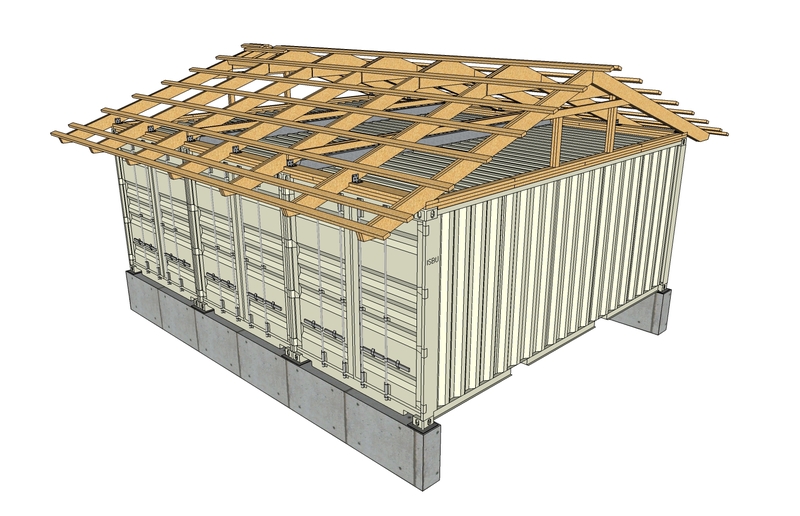 My engineer for this project, George Runkle of Runkle Consulting, determined that two 6″x3″x1/4″ steel box beams would be required to strengthen the roof of the containers where the four walls were removed. The box beams were stitch welded to each of the container box beams that ran the length between each set of containers. 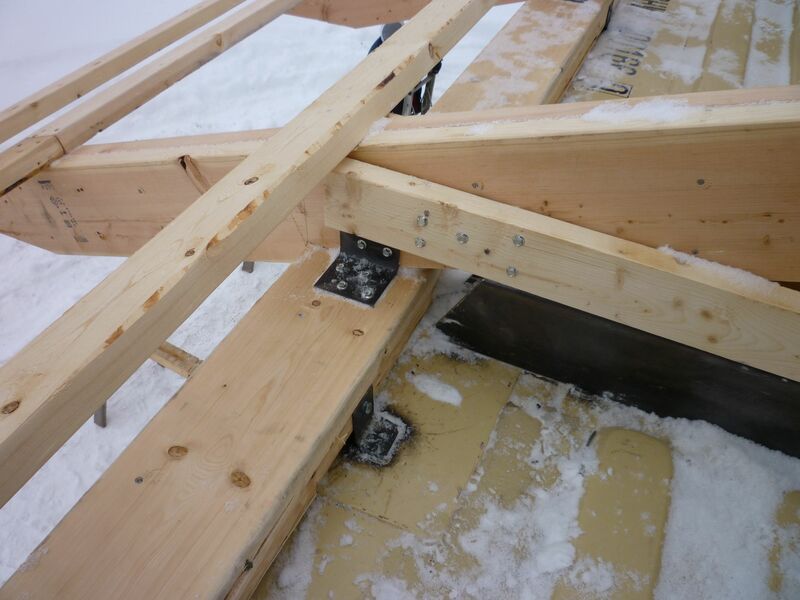 The beams were 18′ 7″ in length to fit between the top plates in addition to being angle cut to fit under the rafters. 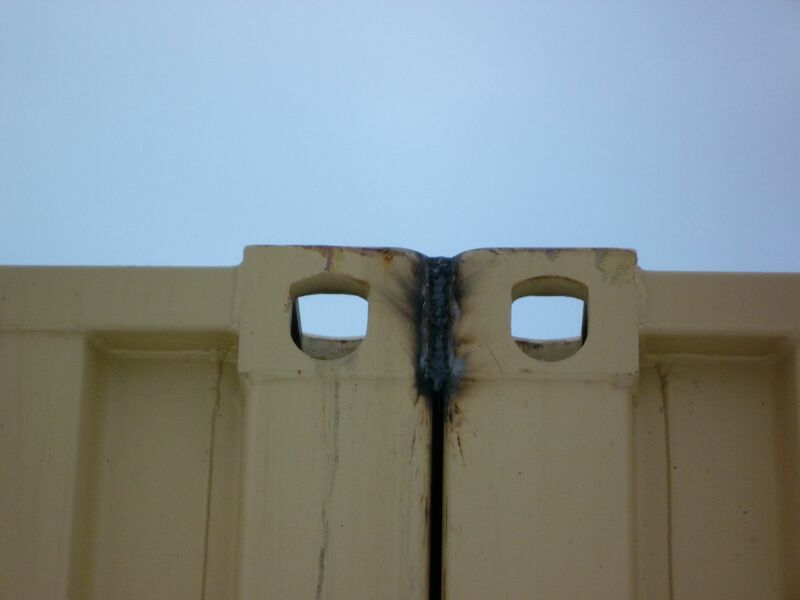 The picture below shows one of the box beams welded to the roof between two of the shipping containers. 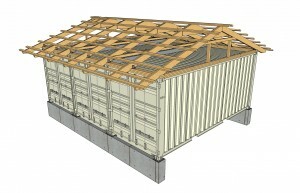 Depending on where you build, and how/if your containers are combined, you may not even need a roof. If you do need a roof, or just want one for appearance sake, it’s really not that hard to build one. A simple low pitched (3:12 or 4:12) shed roof, if you like that look, is probably the easiest and cheapest to build. Be sure to keep in mind how you are going to insulate the roof, and whether of not you will need access under the roof to do it. My roof was a variation of the typical pole shed found around here with rafters and purlins covered with galvanized metal roofing. A simple roof like mine can be completed in just a couple of days with three moderately skilled people. 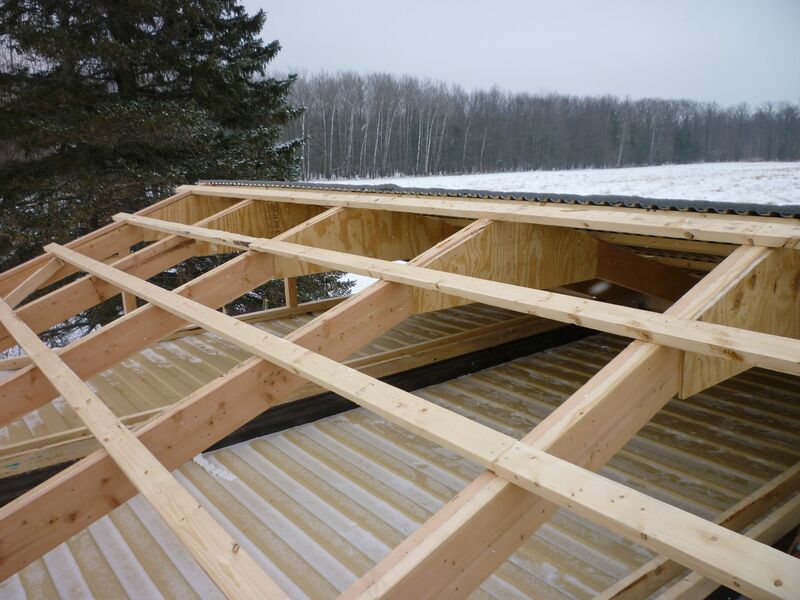 If you’re interested in the details of my roof, I recommend you read my Roof Plans post. 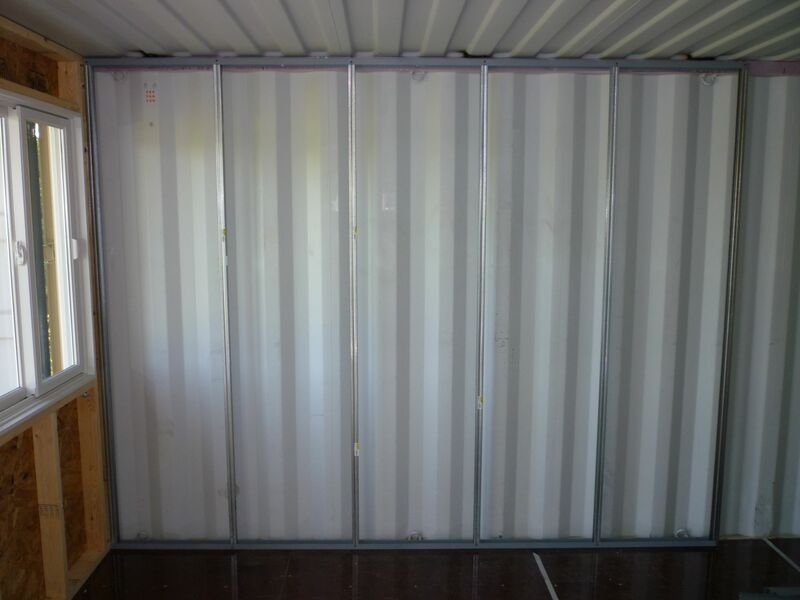 Removing metal from your containers is only necessary if you need passage between the containers, or you plan to add window and/or door openings to the container walls. There are lots of ways to cut through container steel, including a plasma cutter, cutting torch, grinder, and even a jig saw. Don’t laugh at the last suggestion as I easily cut my chimney pipe opening with one. I wouldn’t want to remove an entire wall with one, but for small openings they work well. For removing an entire wall I highly suggest a plasma cutter or cutting torch. While my walls were removed with a cutting torch, I would have much preferred a plasma cutter. A plasma cutter will make much cleaner cuts in the steel, which is nice if you want to re-purpose the steel, and also not char the wood floors if that’s important to you. Since I have absolutely no experience welding or cutting steel, I hired this out to a local welder. The cost was very reasonable and only took two of them about 3 1/2 hours to do. Unfortunately, the wooden floors of nearly all shipping containers are treated with various pesticides. Some “experts” act as if it’s nuclear waste and needs to be removed in every case, and the uninformed simply ignore it completely and use it as is. I think it’s something that needs to be decided on a case by case basis depending on the container’s initial chemical treatment and usage history, but this is a decision that each person will need to make for himself. For my shipping containers I chose to encapsulate the floor with epoxy, and create an additional physical barrier by building a subfloor on top of it. The floors were first solvent washed with 91% isopropyl alcohol, to remove any surface oils and aid adhesion, and then coated with Low Vepoxy from Progressive Epoxy Polymers. The epoxy not only acts as a physical barrier to the wooden floors themselves, but also as a barrier to to any vapors from the treatment chemicals. If you remove any of your interior walls, you create large gaps between the containers that need to be sealed from the elements. One solution I have seen, that is probably the most rugged, is to weld steel strips on the side gaps. If you removed the walls, the roof would already have a beam welded across each gap for structural support. Not being a welder myself, I chose an easier route using backer rod, spray foam, and caulk. Even if you chose to weld steel strips to the outside you would still want to fill the gaps behind them with spray foam. The first step is to get several different sizes of foam backer rod. I found that, in my case at least, different gaps needed different sizes of backer rod. I tried to insert the backer rod to a uniform depth that was about half way into the gaps. I then foamed the gaps from the inside using Great Stuff insulating foam sealant. There was no need to use backer rod on the ceiling as the welded on support beams provided the backing. From the outside I decided to start with a layer of course steel wool to prevent any determined mice from chewing through the foam insulation. On top of that was another layer of Great Stuff foam followed by some backer rod to be a consistent base for the caulk. After a fair amount of research I felt that OSI Quad caulk would be the best option for the final layer. It’s a synthetic-rubber caulk that can stretch without breaking, be repaired (unlike silicone), and can be painted – which I may do someday. I will also keep a close eye on this caulk and report back if I have any failures. This phase of construction is actually pretty easy, especially if you’ve had any rough framing experience, as you’re just creating separate 8’x8′ framed walls to fit into the container openings. 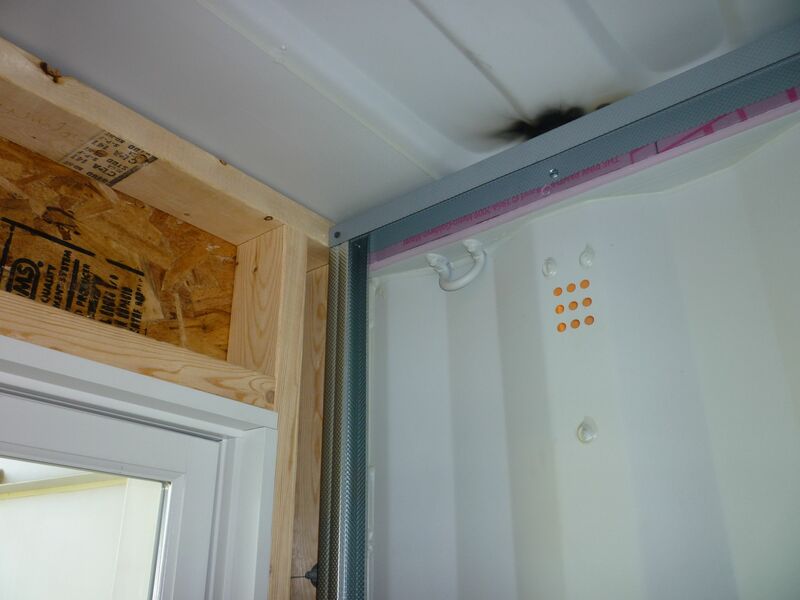 A couple of things that are different from standard framing are how the walls are connected to the containers, and that they are not load bearing. My walls are attached to the containers using a combination of screws, bolts, and even some J-B Weld. 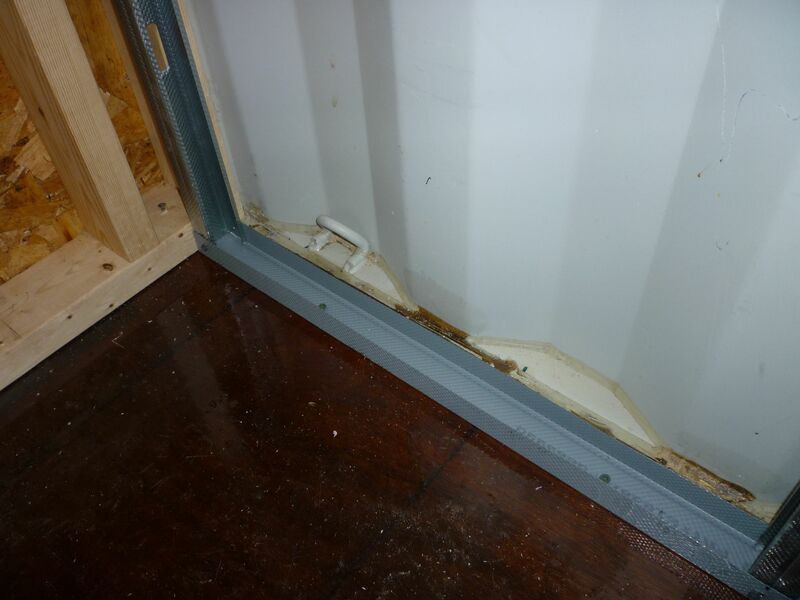 The bottom plate is attached to the plywood floor of the shipping container with 2 1/2″ treated deck screws. Treated screws are necessary here since the treatment chemicals in the plywood would corrode and weaken ordinary screws over time. 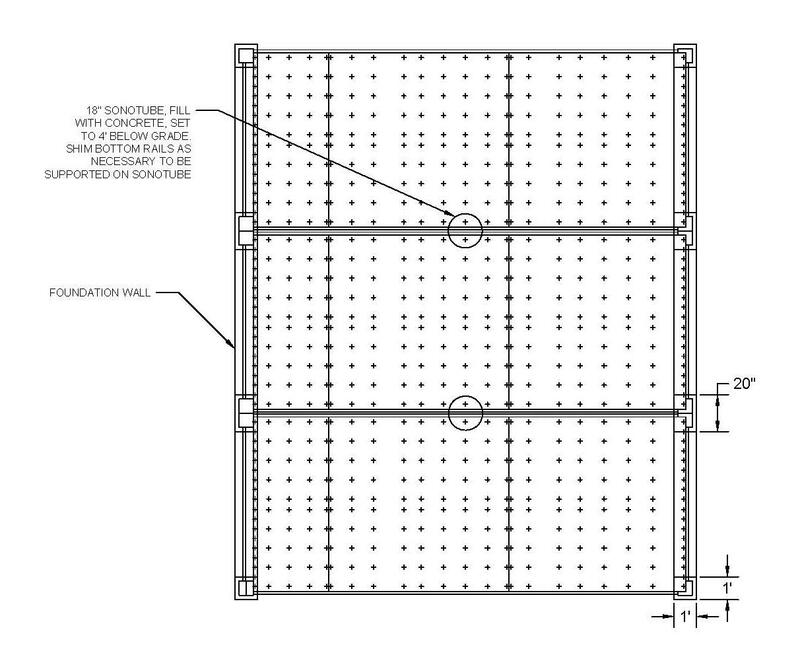 Each outside stud is attached to the steel container wall using three 5/16″ bolts. The bolts that are exposed to the outside are galvanized with bonded washers to prevent any water infiltration through the drilled holes. The top plate was a bit more complicated as I did not want to drill a hole in the top of the container to run a supporting bolt through. Since it only needed a small amount of support, I thought I would try some J-B Weld to hold it in place. I used a small galvanized steel bracket screwed to the front of the top plate and glued to the container ceiling. This seemed to work well and eliminated the small amount of movement that was present. For sheathing I used 7/16 OSB applied vertically to the framing. The sheathing was then covered with 30# roofing felt with double coverage on the bottom half. While I personally like felt as a sheathing wrap, I’m sure most other types would be fine as well. Just about anything goes here. You can choose to have a traditional door with windows as I did, or sliding glass or french doors for the entire container opening. While I’m not a fan of sliding glass doors, I would consider them if I were building in a warmer climate. They do let in a lot of light, which is an advantage when you only have openings on a single side. 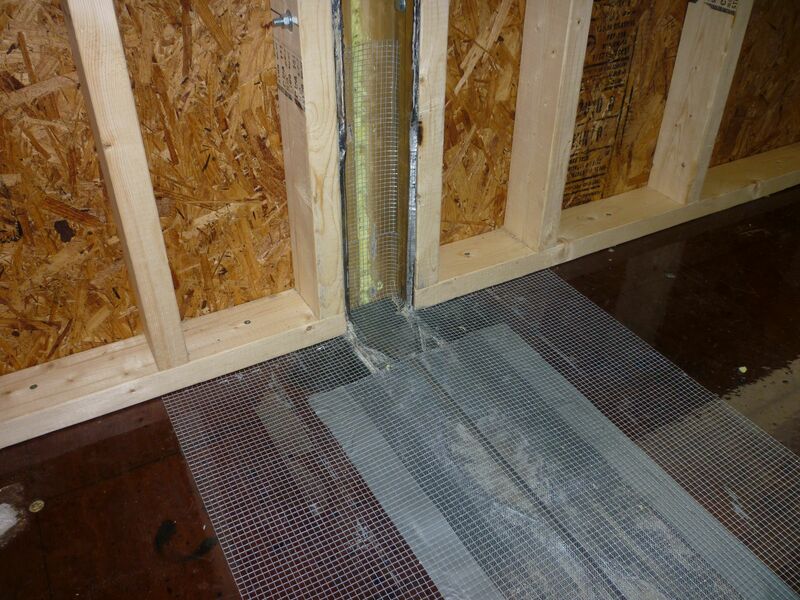 If you are intent on saving as much interior space as possible, consider using 1 1/2″ steel studs. They do a fair job of securing drywall, and are stiff enough IF spray foam is applied to the walls and studs. In areas that the foam did not connect the wall and studs, such as my rear wall, the steel studs are only adequate. An extra layer of drywall, or more narrow spacing of the studs, would definitely help here. If I were to do it over again, I would just use 2×4 or 2×3 wood studs. The amount of space that I saved using steel studs was minimal, and the extra effort to build the walls with steel instead of wood just wasn’t worth it. 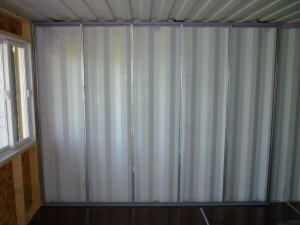 Whichever method you choose, try to include a thermal break between the studs and the metal walls of the container. 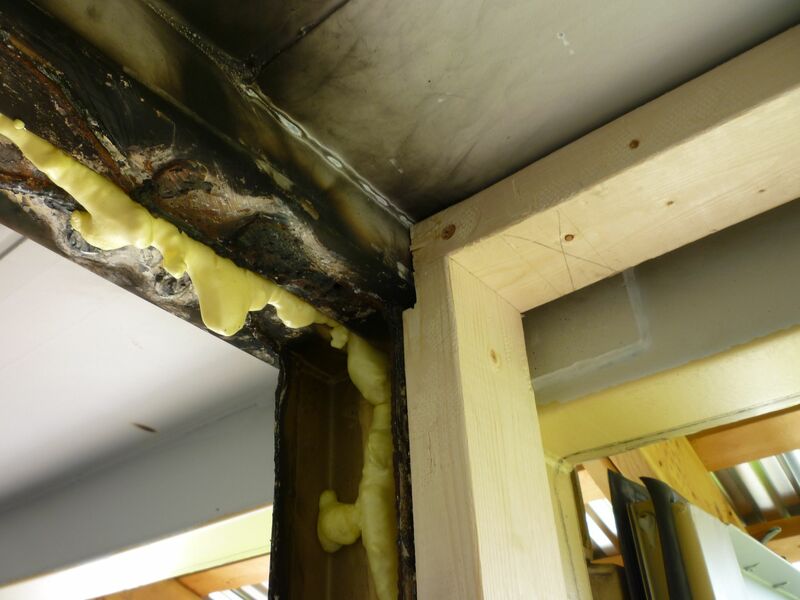 This is especially important when using steel studs as they readily conduct heat from the interior spaces. I used 1/2″ foam board between the upper container box beam and the top plate of the stud wall. This is an optional step, especially if you replaced the floors in your containers. 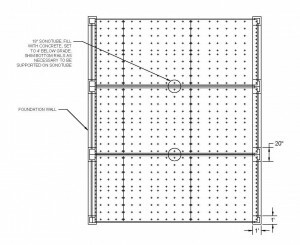 If you want to provide an additional physical barrier to the treatment chemicals, or you need to get above some structural remnants of the containers, then add a subfloor. An interesting option I have seen in container houses is to pour a concrete floor inside the containers on top of the plywood. It could even be the finish floor with some dyes and/or patterning added. Personally, I would only consider this for a full time residence or for a southern climate. I’m not sure I would want to try and warm up a concrete floor when arriving at my cabin on a Friday night in the middle of winter. My subfloor allowed me to get above the remnants of the removed walls in addition to providing a bit more insulation. 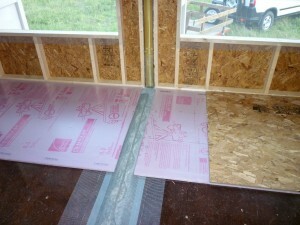 It consists of a layer of 1/2″ foam insulation covered by another layer of 1/2″ OSB. The foam does not cover the wall remnants, which allows the OSB to straddle that space and lay flat. The 1/4″ hardware cloth and insect screen across the gaps are insurance against any mice that might try to chew their way through the spray foam insulation underneath the containers, although I would consider that unlikely. Now is the time to wire your cabin for electricity. Even if you’re not sure you want it, it’s easy and inexpensive enough that you should wire it now because it would be much harder to do later on. The only difficulty in wiring my containers was getting the wire past some remnants of the removed container walls. I tried drilling a hole through the steel, but was having a difficult time even with cobalt bits. I finally chose to run the wire around the steel and make a custom nail protector as seen below. This was easy, cheap, and won’t be seen when the trim boards are in place. If you live in a cold climate, like I do, you will need to insulate your containers. 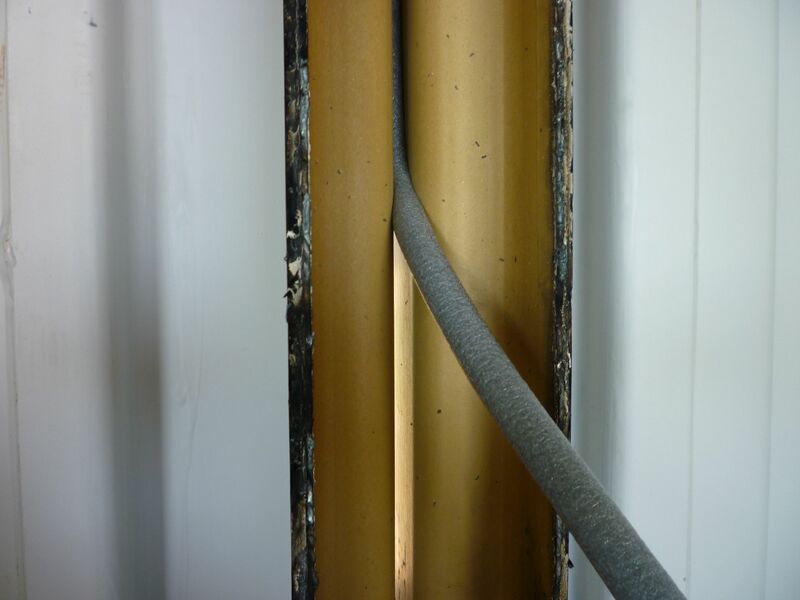 Failing to do so will allow condensation to easily form on the interior steel walls, resulting in a host of other problems such as corrosion or mold. 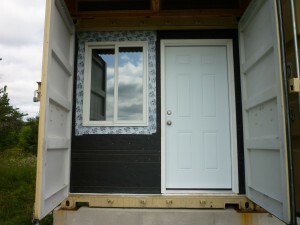 You can insulate the containers on the inside or the outside, just as long as you do insulate it. 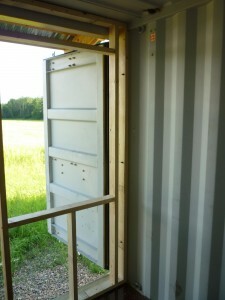 Deciding which side to insulate really depends on what you want your shipping container cabin to look like. Insulating the outside of the containers is usually done when you want to have a more traditional appearance to your cabin. Cedar, vinyl, and even log siding can be applied over the insulated exterior of a shipping container. Having the insulation on the outside also allows you to utilize the full space of the containers, as long as you like the look of corrugated steel walls in your interior. 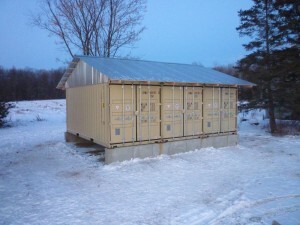 I have also heard that insulating the outside of the containers is a better choice for cold climates. Insulating the inside of the containers allows you to have a rugged and low maintenance steel exterior with a more traditional interior. My cabin is a hybrid of these two approaches as I insulated the interior walls and the exterior ceiling of the shipping containers. My reasoning for this is that I wanted a low maintenance steel exterior with as much headroom as possible in the interior. Keep in mind that the only reason I was able to do this is because I built an additional roof over all of the containers that would protect the exterior insulation. There was some concern that the metal ceiling might allow condensation to form around the edges, but that has not happened even in the coldest weather. When it comes to what type of insulation to use, I believe the only one to consider is spray foam. Even though it’s the most expensive route, I feel the benefits far outweigh the financial disadvantages. A minimum 2″ layer of spray foam will create a seamless vapor barrier against the metal walls of the container, add structural support to the walls and framing, and allow for thinner side walls and greater interior volume. If I were insulating the inside of a container I wouldn’t trust any other method to prevent condensation from forming behind the walls.